NOT on our shelves now. Usually ships 1-10 business days from warehouse. ETA will be updated with email order confirmation. New York Times bestselling author Jenny Han’s beloved novels are now available together for the first time in this delightful hardcover boxed set! Lara Jean Song keeps her love letters in a hatbox her mother gave her. They aren’t love letters that anyone else wrote for her; these are ones she’s written. One for every boy she’s ever loved—five in all. When she writes, she pours out her heart and soul and says all the things she would never say in real life, because her letters are for her eyes only. Until the day her secret letters are mailed, and suddenly, Lara Jean’s love life goes from imaginary to out of control. 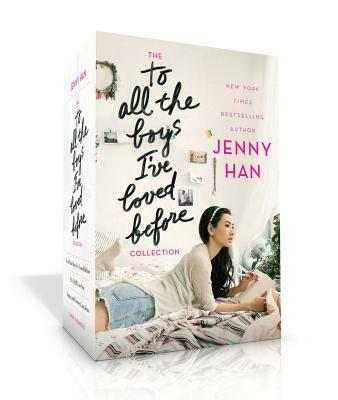 This enchanting collection includes hardcover editions of To All the Boys I’ve Loved Before; P.S. I Still Love You; and Always and Forever, Lara Jean. Jenny Han is the New York Times bestselling author of The Summer I Turned Pretty series; Shug; the Burn for Burn trilogy, cowritten with Siobhan Vivian; and To All the Boys I’ve Loved Before and P.S. I Still Love You. She is also the author of the chapter book Clara Lee and The Apple Pie Dream. A former children’s bookseller, she earned her MFA in creative writing at the New School. Visit her at DearJennyHan.com.